One of my main interests here is the 10 or so species of dragonfly that can be seen along the banks of the river but there are other critters to be seen, too. 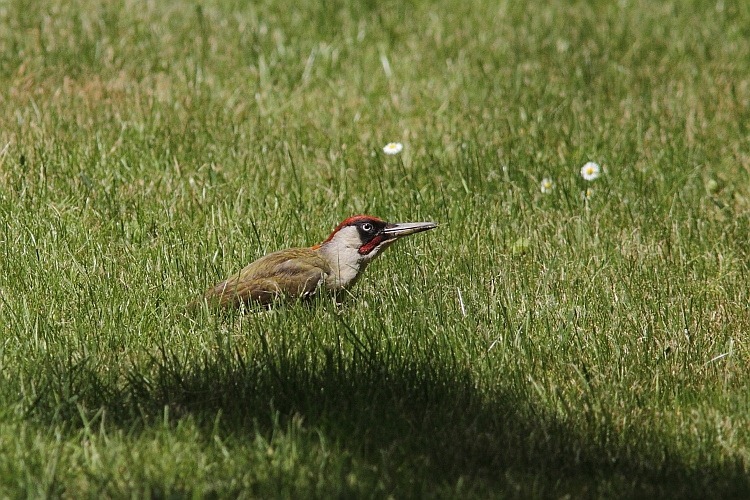 Early on in the day I got a rare chance to sneak close enough to a Green Woodpecker (Picus viridis) for a recognisable shot, even if it kept its tail hidden in the grass of the campsite. 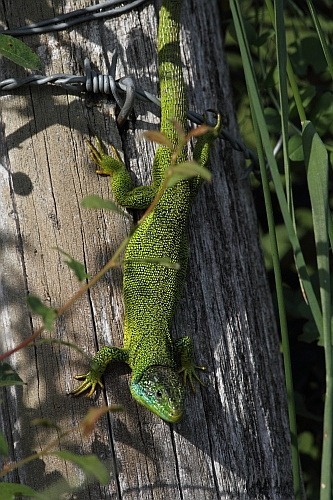 Later, while we were out wandering the banks in search of our usual quarry, Odos, what I can only describe as a vividly green lizard sat head-down on a fence post beside one of those fallow fields that I mentioned. I say, “only describe as” because I have no idea what particular lizard this might be, though, given a book on European reptiles, I’d have thought it might be relatively easy to identify. It, too, kept its tail hidden before scarpering completely. Not all the green tails of the day remained hidden, however. 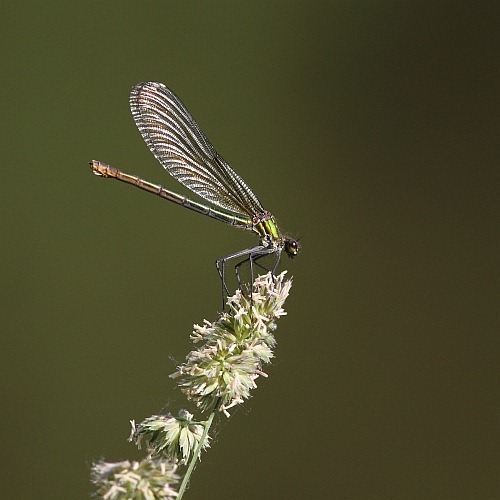 Among the 10 species of Odonata were literally swarms of Banded Demoiselles (Calopteryx splendens), sometimes rather romantically referred to as riverside butterflies, flitting back and forth along the bank. The frantic flitting is, of course, for one of two reasons, either males in a territorial spat or a male in pursuit of a female. Eventually an unpursued female posed advantageously on a seed head offering a much more artistic picture than had the earlier individuals. A final few moments of excitement occurred as we were setting about our evening barbecue. While it was firing up – yes, we still use real charcoal – we both spotted some movement in the grass just in front of it. 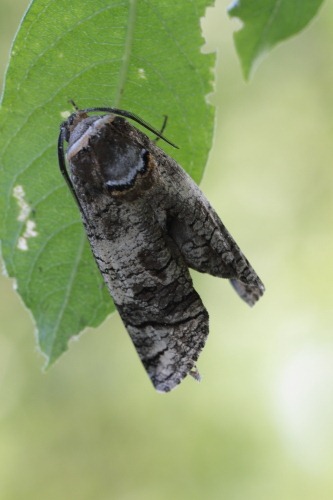 Confused at first, we eventually realized it was some sort of moth. Its wings were still not fully inflated. 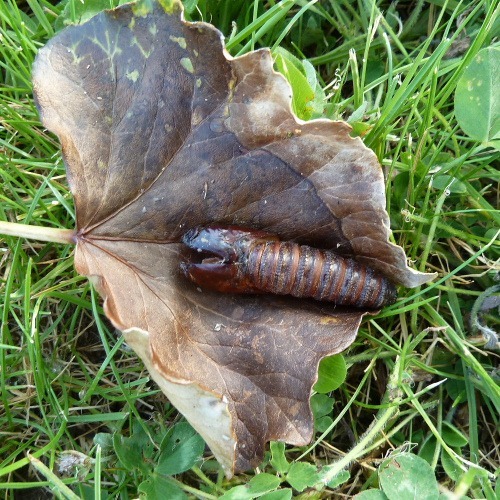 It had just emerged from its pupal case which was about 3cms long, still half buried in the ground and decidedly gooey. Despite this, Francine grabbed it so we could snap it for the record. 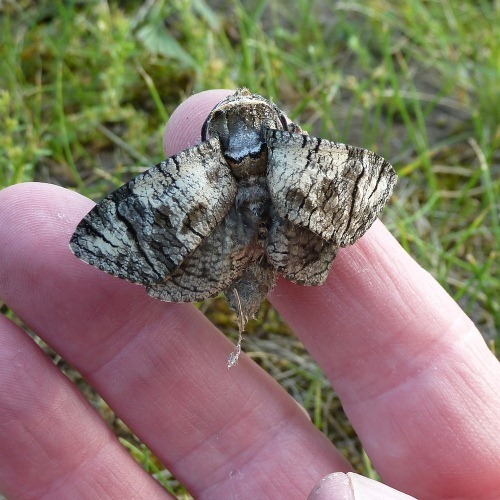 The poor moth seemed to be missing two legs but, with wings now fully inflated, it eventually flew off so we’re hopeful that it might fulfil its mission in life, reproduction.